Heathrow will be hell today. Apparently it’s going to be the airport’s busiest day ever, as the first wave of Olympic athletes is scheduled to arrive. They’ll step straight into queues to have their passports stamped by immigration officials with just a couple of week’s training, then on to even longer queues at the lost baggage desks. There’ll be international temper tantrums by nightfall. Up here in the North East, we’re well out of it. We should be thankful that the Olympic Games hasn’t fulfilled its promise to be an event for the entire nation, grateful that the only long term benefit for Britain will be some sports stadia and a park in East London: at least we won’t have to suffer for the next month – we can just let London get on with it, and just watch the highlights on the telly. Can you imagine how unpleasant it will be? Residents’ car parking permits suspended, roads slimmed to a single lane to allow VIPs to speed through like Eastern European potentates, people jammed onto public transport like sardines, restaurants and hotels tripling their prices. And all for what? For £9bn of our money, that’s what. I saw a press report the other day lauding the fact that the Olympics are “under budget” by £476m. By my calculation, that’s around £6.5bn over the budget Lord Coe promised when he and his team persuaded the International Olympic Committee to hang this millstone round the national neck. The French, pipped at the post by just four votes, must be smirking down the Champs-Elysées, as they watch real tourists pouring into Paris this month. This year, European capitals will enjoy their busiest summer, while Britain, for all the officials and athletes, has gained no benefit from visitors at all. Just over 30 million visitors arrived on our shores last year, and this year they predict exactly the same number. The total visitor spend will be £17.6 billion, precisely the same as it was last year. 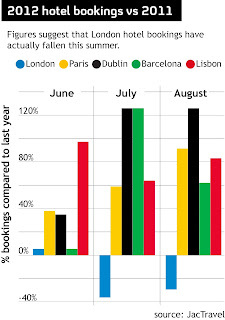 London hotel bookings for this July and August have actually fallen by around 20%, while those in Paris have risen by 90%; Dublin and Barcelona have both seen an even bigger surge in demand. 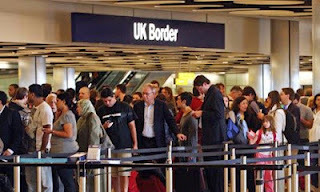 The Olympic Games have succeeded in scaring away our tourists in the middle of a recession. Of course, the Olympic organisers say the cost is nothing compared to the ultimate benefits for the country: this is, after all, a giant photo opportunity for the UK. Which is presumably why Danny Boyle is building a picture of our farm in the middle of the stadium for his eye-wateringly expensive opening ceremony. I could have taken a photo from our bedroom window and emailed it to all the spectators. We too have fields, cows, and even some racing sheep. I doubt his £27million ceremony will deliver a single additional tourist to our region. Of course, we’re hoping for great things from our sportsmen and women, and I sincerely wish them luck. But their sporting prowess (theirs, not ours, of course – it’s done nothing for the nation’s waistline, I see no kids jogging round our parks, no tangible benefits for the rest of us) has come at a terrible price. There’ll be no compensation to the good causes, which saw their combined grants from the Big Lottery Fund halved in 2009 from £1.2 billion to £500 million, then halved again last year. The so-called Cultural Olympiad has been no recompense to the hundreds of arts organisations that have closed down to pay for a few thousand people to run around the country with a gas-filled metal torch. Sure, one British company has produced 6,250 anti-doping tests, another has made 26,400 tennis balls, a few others will provide some of the 14 million meals over a few weeks, another is providing 150,000 condoms for the athletes’ village, and I guess quite a few casual builders have been employed in East London. But that’s not what you’d call a lasting legacy. A recent poll found that only 54% of us think the Olympics will be good for Britain. No surprise there, then.